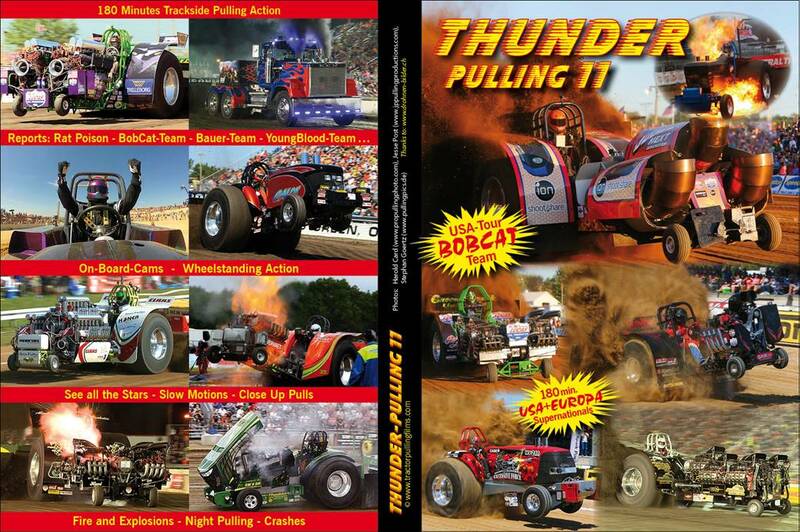 Thunder Pulling 11 is on sale now! The new released part of the "Thunder Pulling" series is on deck. Filmed with professional, High Definition camera-equipement, and available on DVD and also BluRay-Disc. High quality in Picture and Sound. So you feel the noise and earthshacking blast when the Pulling Machines are thundering down the track. The new film starts up with the SUPER NATIONALS of Pulling, in PULLTOWN USA - Bowling Green Ohio. By far it is the biggest, most exciting and most spectacular Tractor Pull in the world. The organisation run 2 Tracks side by side and there are over 50 Tractors running in some classes. All the Stars, big names and "underdogs" of american pulling are there and battle for the "Ring". Every team is well prepared and runs on the limit. Great Pulling Action is garanteed. Pulling Action is going on from Friday noon until Sunday evening. also under the lights in the night. This year the netherlands "BOBCAT TEAM" from the Boer family toured the USA and run the NTPA and PPL pulls. Berry and his father Bertus Boer were very successful with their wonderful, homebuilt "Bobcat" Mini Machine. We begleiten the team the whole weekend, with interviews, great pulling action, up and downs, like their crash at the Pullingevent in Hillsboro, Nebraska. But finally the Boers team made it on the podium and won the PPL-Championships. The first european team winning it. Congratulations to you All. Watch the intro of "THUNDER PULLING 11"
BOBCAT team - Berry Boer pulls in the tuffest Mini competition. The europeans are on the top field of the huge class, where almost everybody can win. Berry and his father Bertus gaves us great interviews, reports and performed actionpacked pulls. NoMercy team - Bruce and Tiger Slagh experience with a new frame-construction, sitting almost on the engine at their beasts. All those Pulls were very exciting with a lot of international starters and Pulling Tractors from all over Europe. Many new Teams performed this year at the european scene and a lot of action was on the Tracks. With a teamreport from the german Super Stock team Kaiser and their one of a kind John Deere.